St. Bernadette Catholic Academy, an NCLB National Blue Ribbon School of Excellence, serving students from Pre-Kindergarten (3 Year Program) through Grade 8. Our school, founded in 1953, continues to thrive spiritually and academically. As of 2016, St. Bernadette School is recognized as St. Bernadette Catholic Academy, continuing our unique legacy. We are persistent in maintaining and upgrading staff, resources, and facilities so as to keep pace and surpass the ever-growing demands of technology and curriculum. Our diligence has produced two NCEA distinguished teachers and likewise, our principal was recognized as the NCEA Distinguished Principal, both honors reflect national acknowledgement. 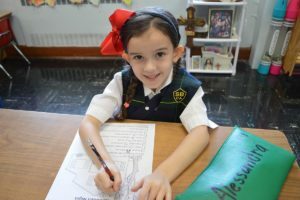 St. Bernadette Catholic Academy offers a strong Catholic academic environment, where, in addition to learning about our faith and allowing it to permeate our day, we value academic achievement and reach to meet and exceed standards range in all areas; giving every student the opportunity to reach his/her potential. The academy is very proud of our Class of 2018! Graduates earned over $663,000 in high school scholarships and have been accepted to the following schools: Bishop Kearney, Bishop Moore Catholic (Fl. ), Brooklyn Technical, Chaminade, Fiorello H. LaGuardia, Fontbonne Hall Academy, Joffrey Ballet Dance Academy, Monsignor Farrell, Moore Catholic, Notre Dame School of Manhattan, St. Edmund Preparatory, Saint Joseph By-The-Sea, St. Joseph Hill, Saint Saviour, Staten Island Technical, Leon M. Goldstein, Xaverian, and Xavier. St. Bernadette Catholic Academy has a faculty comprised of religious sisters and dedicated lay teachers who collaborate to build a caring community based on the tenets of Jesus Christ and a strong academic foundation for its students. St. Bernadette provides for its students, studies in religion and a common core based curriculum, as well as special content areas of Italian, technology, art, music and physical education. The curriculum is supplemented with, among other things, the Accelerated Reader program, Mathletics, and a Latin and Greek Roots Challenge program. The Academy is extremely proud to offer eighth grade students the opportunity to participate in honors math and history courses and exams which will apply New York State Regents credit to their high school academic records! Extra-curricular activities provide students with an opportunity to develop their leadership skills and areas of interest and personal talent. An active student council provides the student body with events and gatherings throughout the year. Additionally, students have the opportunity to participate as members of the hand bell choir, school band, book club, journalism club, choir, violin, robotics, craft club, confectionary club, geography club, chemistry club, Mathletics Club, and altar servers. Students who thrive on academic challenge engage in math, history, geography and spelling bees. Similarly, gifted students are recognized via the Johns Hopkins search for talented youth and the Junior National Young Leaders Conference. Celebrating over 60 years of excellence, St. Bernadette School looks forward to a future bright with promise and the commencement exercises of its youngest members, the children currently enrolled in our three-year-old program in 2025!